Green Israeli Ruscus (Ruscus hypophyllum), also known as Butcher's Broom, has dark green foliage with fine texture, stiff stems, and long vase life. Its bold, bright green look and linear shape adds focal interest to any bouquet and arrangement. It is very durable and can be used dried or fresh. ORIGIN: Israeli Ruscus is native to Northwest Africa, Sicily, and the Southern regions of France and Spain. 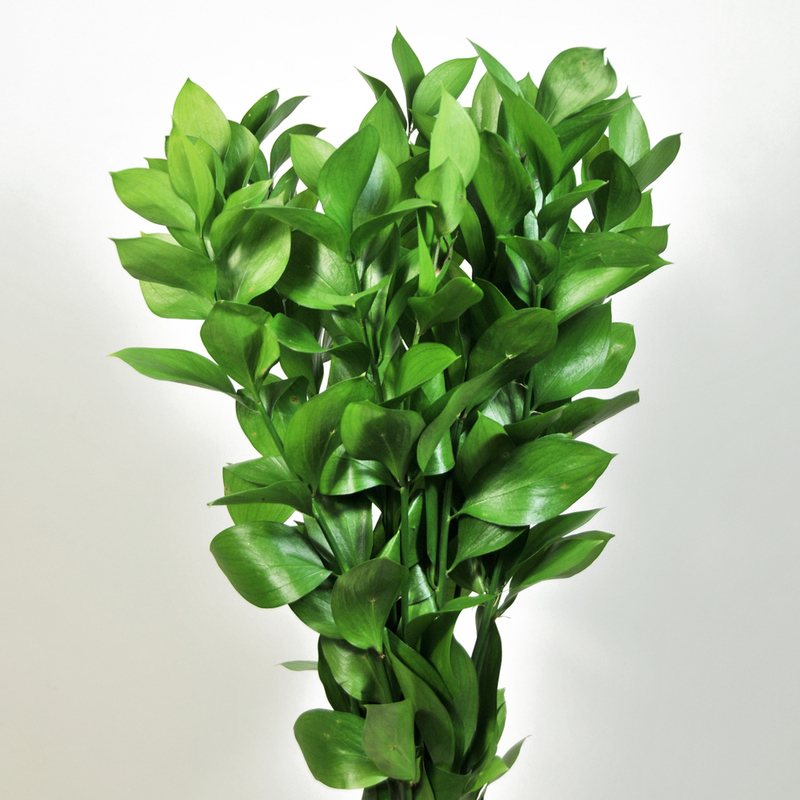 Israeli Ruscus is part of the Asparagaceae Family, which is home to several other popular cut foliage plants. 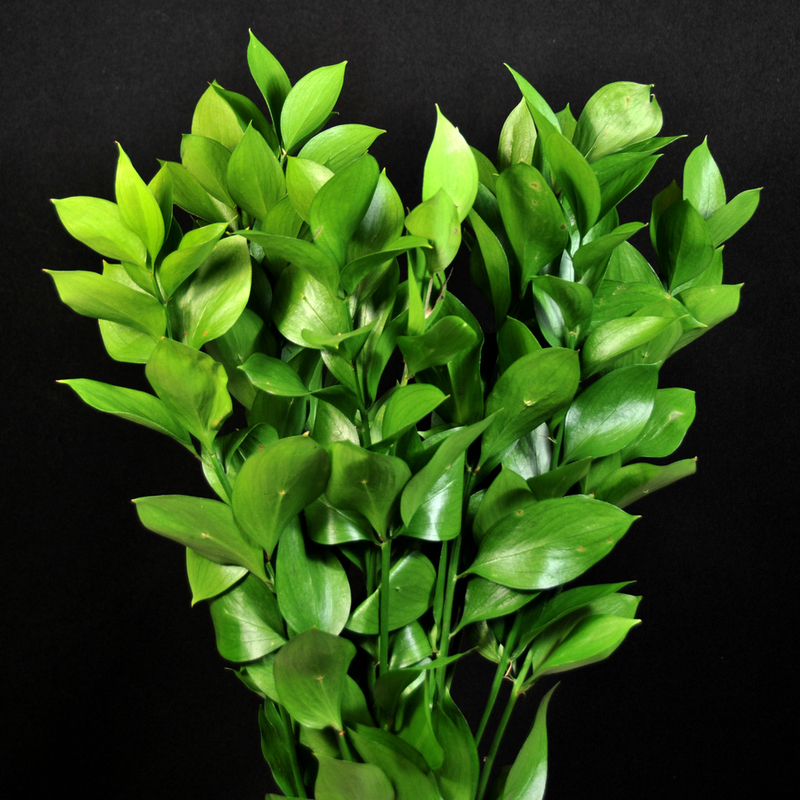 CARE & HANDLING: Typically, stems of Israeli ruscus will last in arrangements for a month (and sometimes longer). Upon arrival of your ruscus, fill a clean vessel with at least four inches of fresh, cool water. Gently remove any foliage that will sit below the water (leaves left under water will rot and add bacteria to the water, shortening the vase life). With a sharp knife, cut stems about an inch from the bottom, and place ruscus immediately in the prepared water. Add more water as needed, and change the water every day or whenever it appears cloudy. Keep way from excessive heat and direct sunlight for longest vase life.